It's the national holiday for gooey sandwiches, and the famed bread bastion is throwing a bash. The national holiday for gooey sandwiches is upon us, and SoCal's famed bread bastion is throwing a bite-packed bash. If we were to tell you that National Grilled Cheese Day is on Wednesday, April 12, would you gently scoff and then proceed to inform us that, as far as your stove is concerned, it is always some sort of grilled cheese holiday? Yeah. That's the way it is in a lot of households, and understandably so. After all, Grilled Cheese only requires two excellent foodstuffs — cheese, spoiler alert, and the "grilled" part, which is bread — which tend to be staples most people currently have in the fridge, and cupboard, with no store trip is required. But if National Grilled Cheese Day has you longing to fancy-up your fromage enjoyment, and the savoring of artisanal breads, gaze upon one of LA's best known breaderies for le ultimate grilled cheese-themed bash: La Brea Bakery. Grilled Cheese Night, the La Brea Boulevard boulangerie's annual snack-big celebration, is again set to take place on the evening of National Grilled Cheese Day, with an assortment of passed grilled cheese sandwiches to nosh upon. Think "Roquefort and Spicy Apple Chutney on Walnut Bread" and "Taleggio, Wood-Roasted Mushrooms, and Roasted Garlic on Kalamata Olive Bread" and a number of other gooey, dairy-delightful, staff-of-life-amazing choices. A "live DJ, red carpet entrance, champagne/wine" and more goodies are on the 7 to 10 p.m. schedule. Cost to find your new favorite grilled cheese style? It's $35, and tickets are still available. Fine. We won't be presumptuous. Maybe your favorite grilled cheese style is the the style you've always made your go-to lunch in, with two buttery slices of sourdough and two slices of gouda in the middle. Grilled cheesies, which are, of course, intense fans of grilled cheese sandwiches, know there are always haute new horizons where what seems like the world's simplest meal lives. 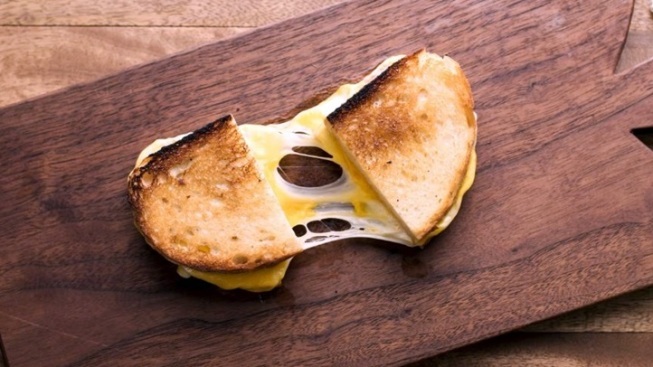 It may be just bread and cheese, in the end, plus heat, but given the vast universe of cheese, breads, condiments, olives, vegetables, and such, exploring the grilled-cheeseverse, which is like a universe for grilled cheese, is a melty must.